The New York Times bestseller that explores how everything from finances to physical health affect overall quality of life. When striving to improve our lives, we are quick to buy into programs that promise to help us make money, lose weight, or strengthen our relationships. While it might be easier to treat these critical areas in our lives as if they operate independently, they don’t. Gallup’s comprehensive study of people in more than 150 countries revealed five universal, interconnected elements that shape our lives. By the time you finish reading this book, you should have a better understanding of what makes life worthwhile. 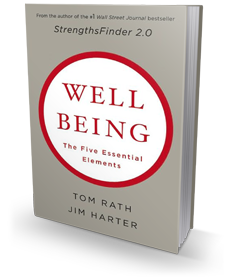 This will enable you to enjoy each day and get more out of your life — and perhaps most importantly, boost the wellbeing of your friends, family members, colleagues, and others in your community. Short-term incentives that are consistent with our long-term objectives help us make better decisions in the moment.